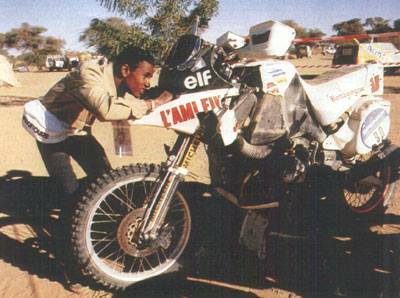 This photo, depicting Pierre Marie Parker, sums up perfectly the genius of project Ecureuil 1989. 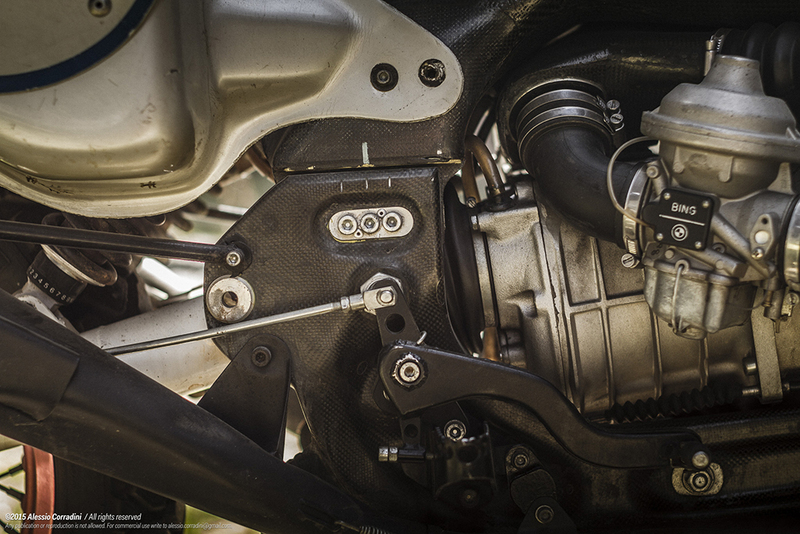 To facilitate maintenance the bike, unscrewing a few screws, literally separated into two parts, favouring the maintenance. 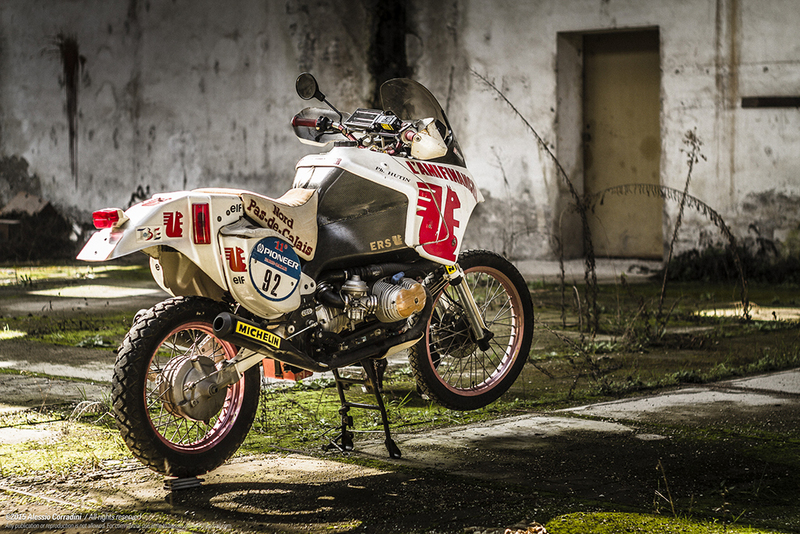 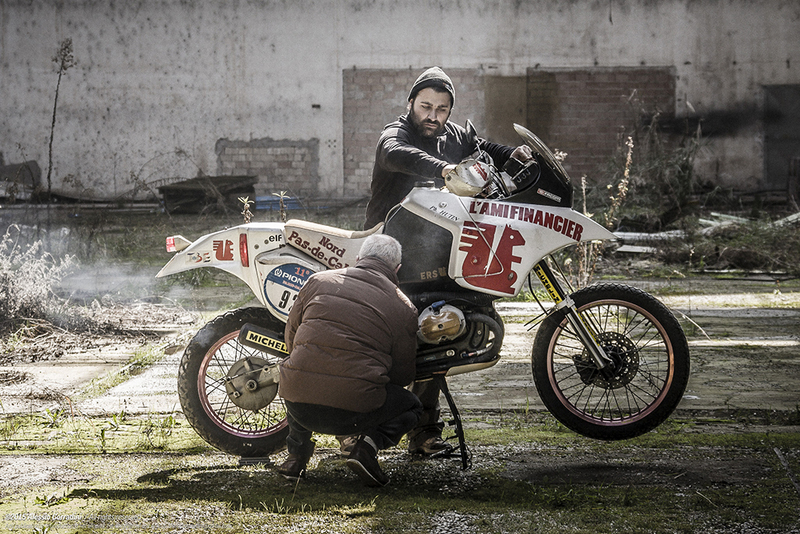 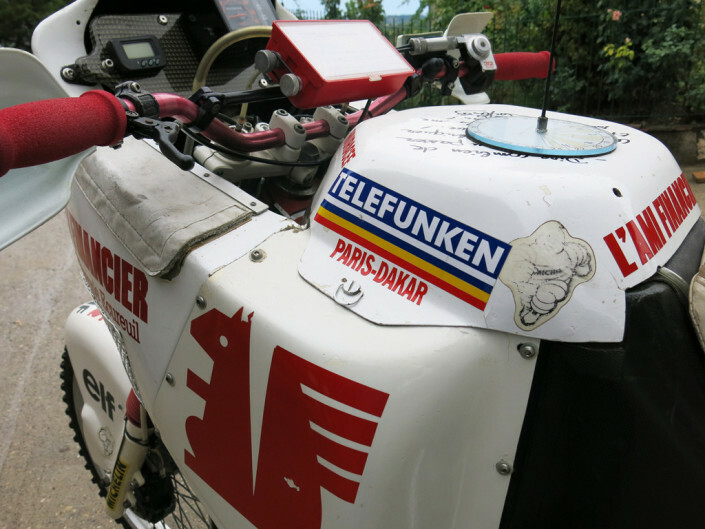 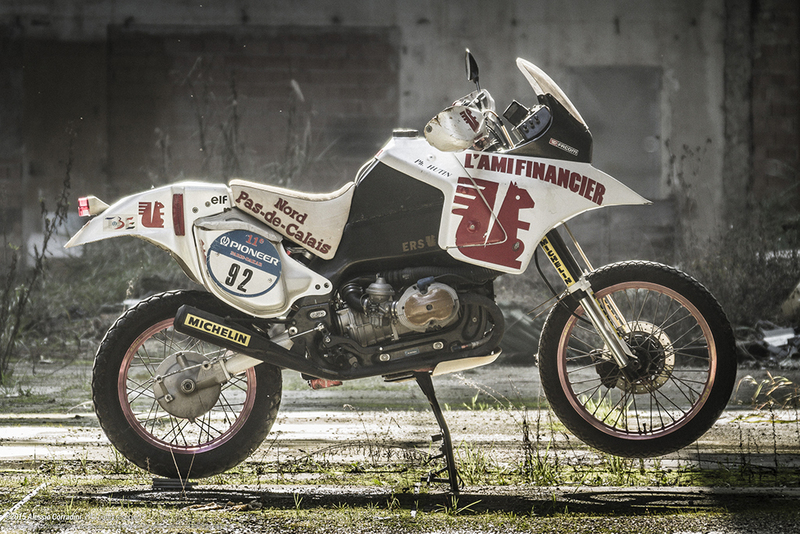 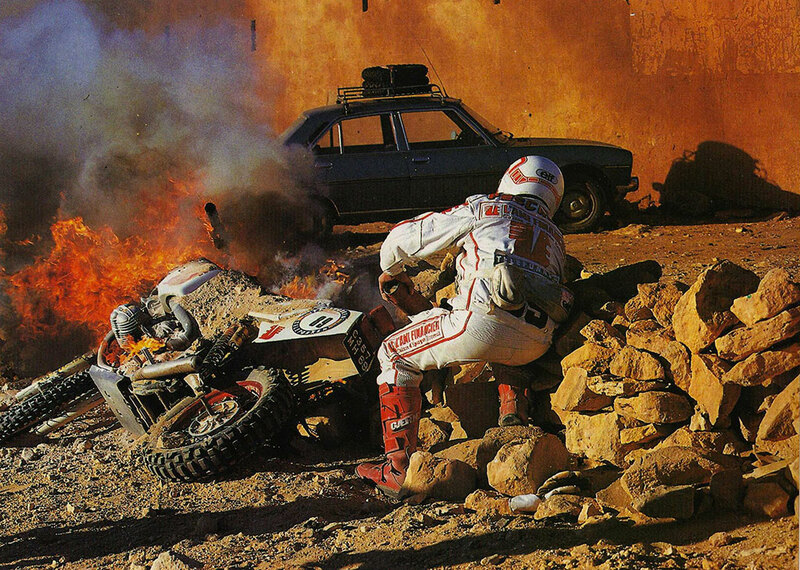 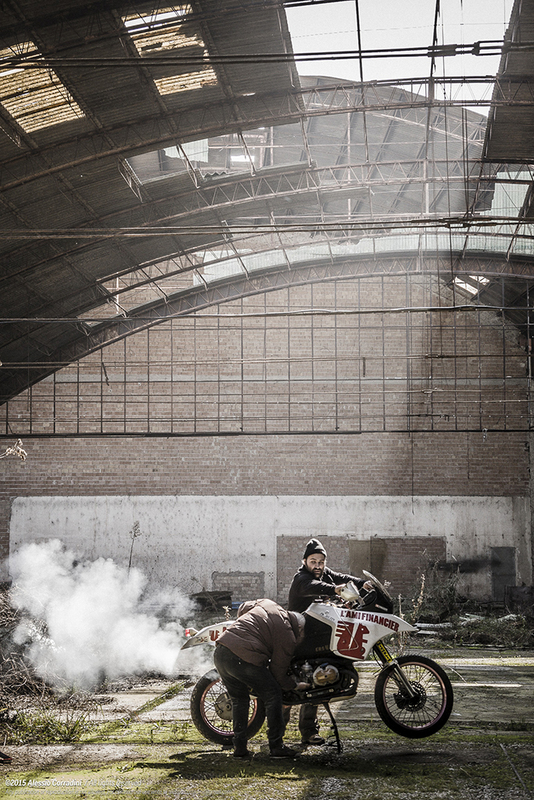 An unfortunate Daniel Pescheur see “go up in smoke” his Dakar 1987 and his Ecureuil 1000|!! 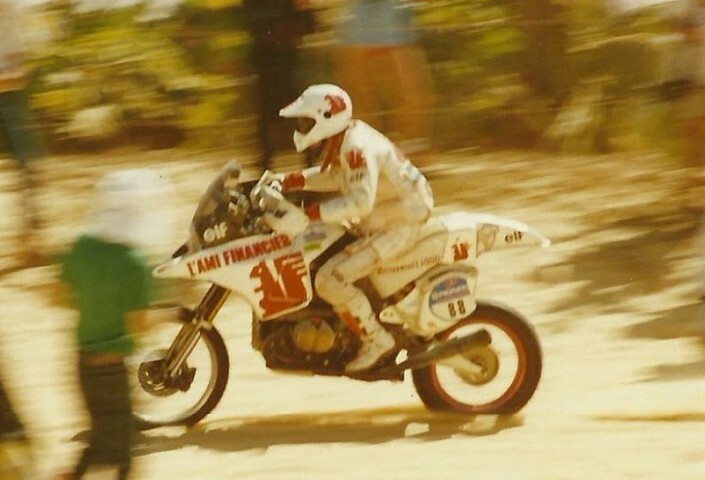 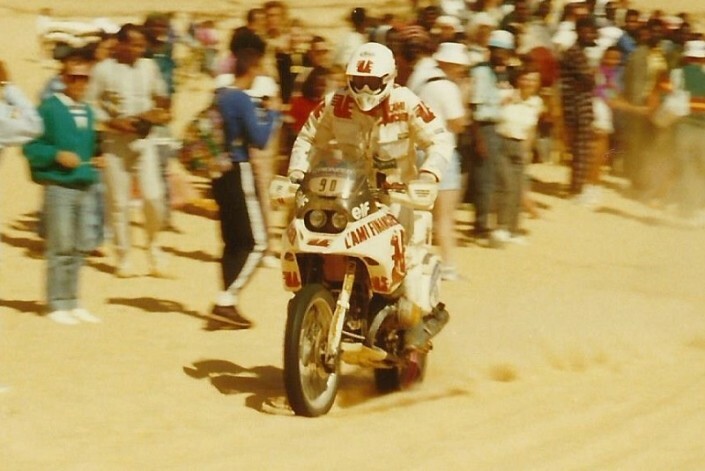 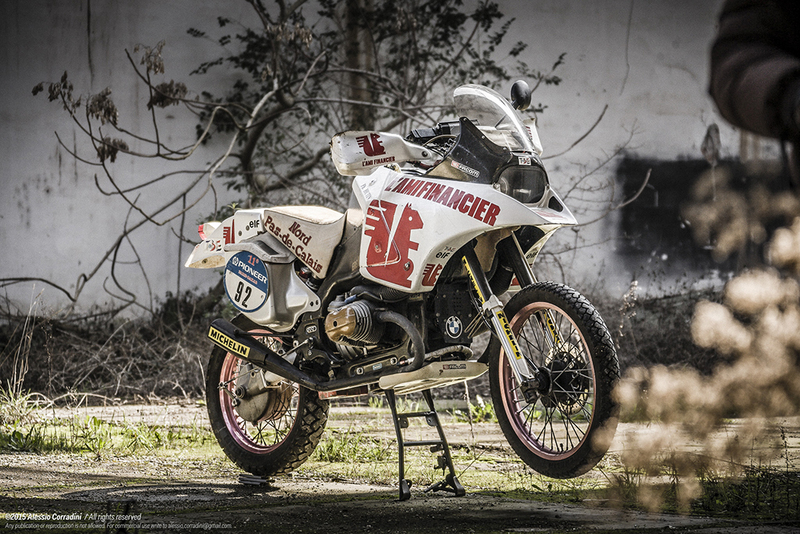 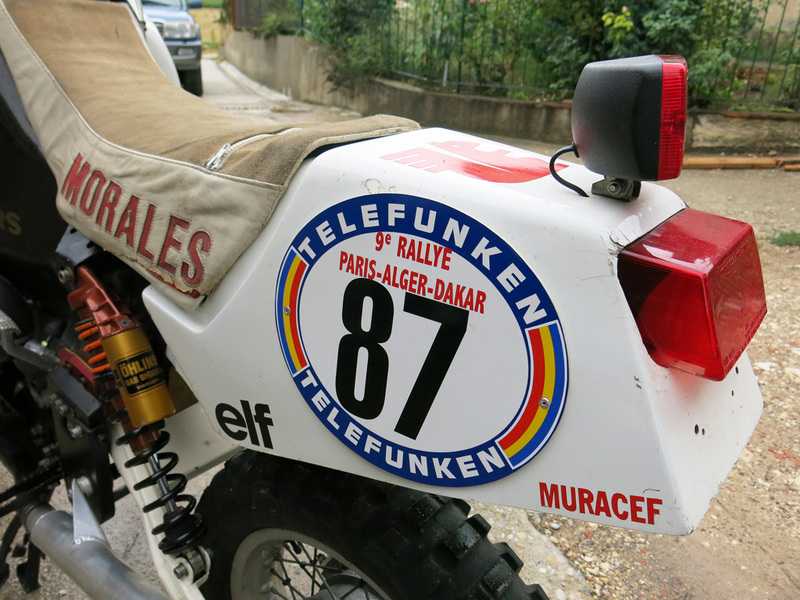 "Hubert Rigal, our expert and former participant in the Paris-Dakar was able to find, After a year of surveys, one of the most surprising among the prototypes of the years ' 80 who participated in the world's toughest rally. 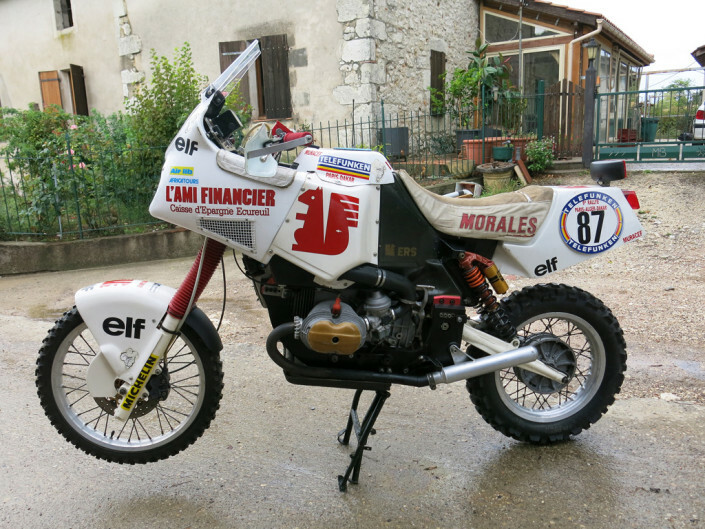 It all started in 1986, When the technician Joël Guillet and reporter Pierre-Marie Poli, Chief Editor of the French weekly Moto Journal, came up with the idea of a revolutionary bike. 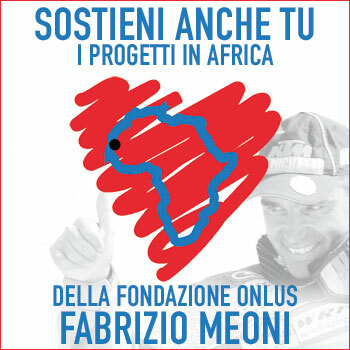 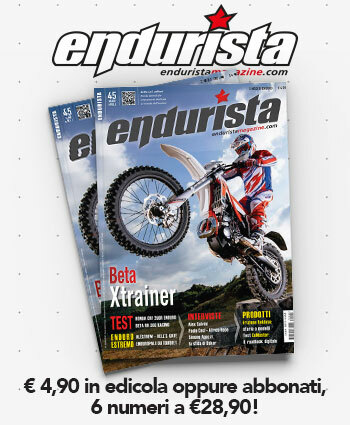 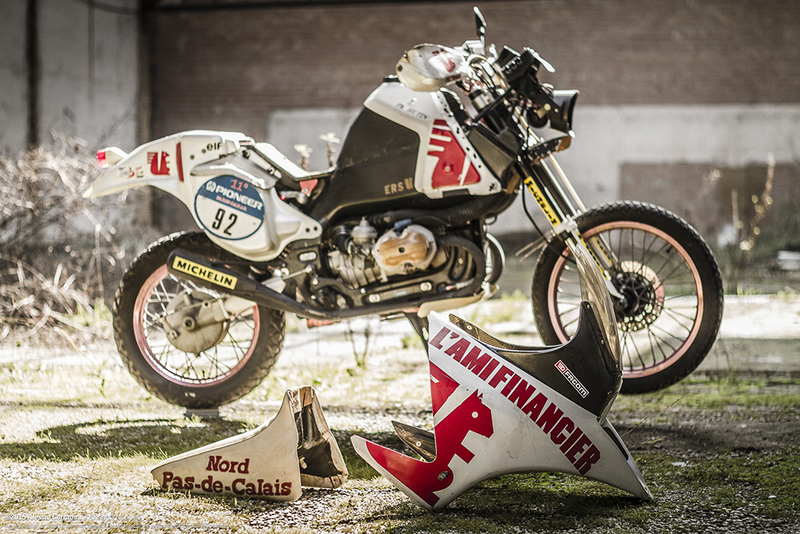 Promoted by the Cassa di Risparmio Écureuil, the eponymous racing team Écureuil was created with the aim of entering the world of the Paris-Dakar, outstanding media vehicle of the time. 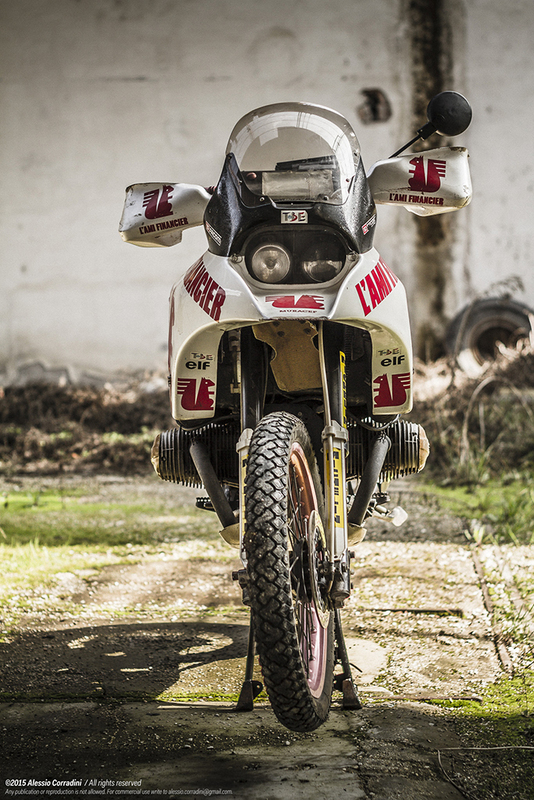 Powered by a BMW (the brand that won the 1983 and 1985), the particularity of this “ERS 1000” is its modular conception and carbon as a material that distinguishes. 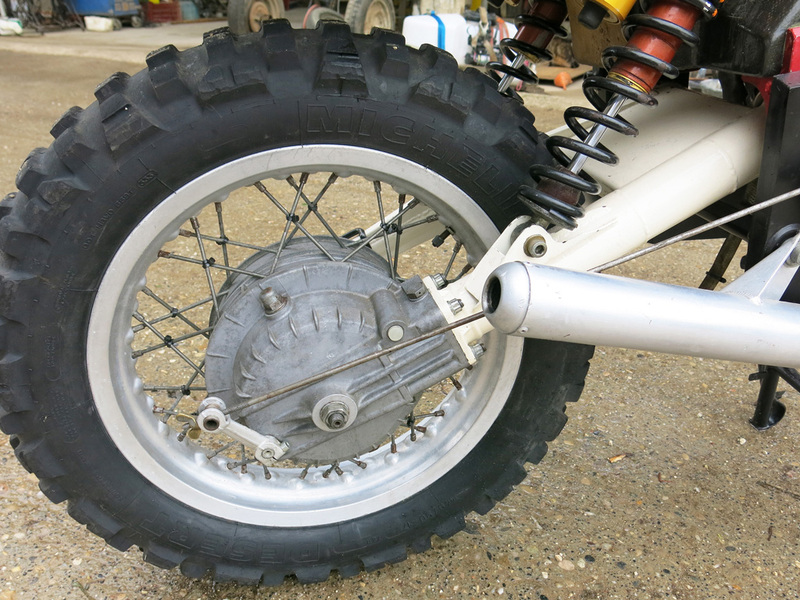 – The front suspension, attached on the front. 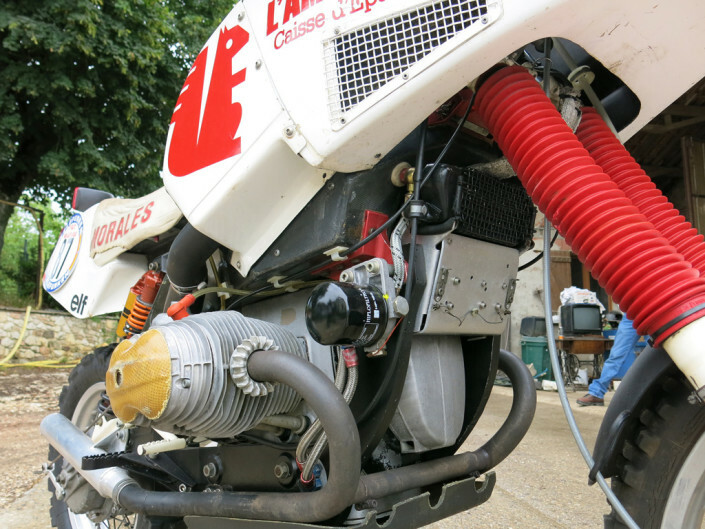 The main advantage is the quick fitting: It only takes six minutes to remove the engine and transmission! 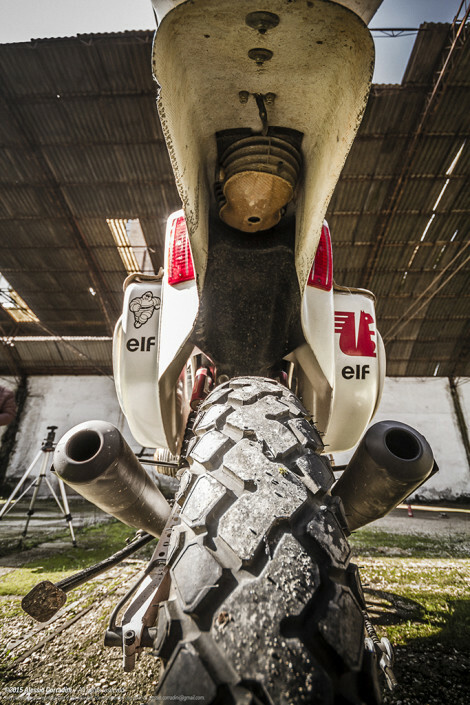 This makes it easy to adapt the bike to the challenges of each stage. 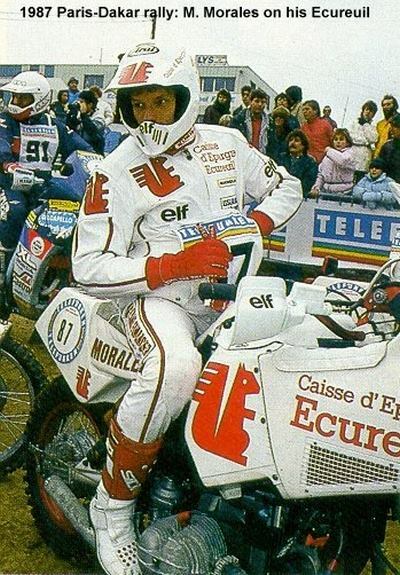 In 1987, three Écureuil entered the race, led by Pierre-Marie Poli, Marc Morales and former policeman Daniel Pescheur. 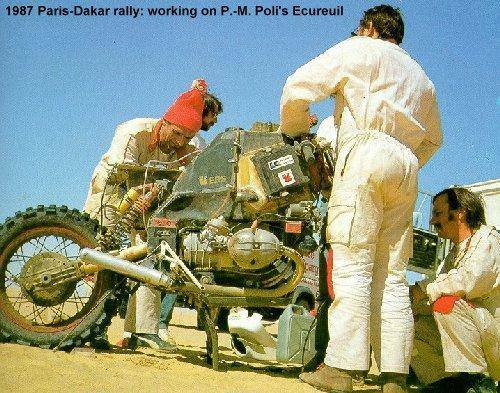 Parker never made it to arrive in Dakar, Pescheur's bike caught fire in the desert and Morales, Although arrived at the finish was not qualified. 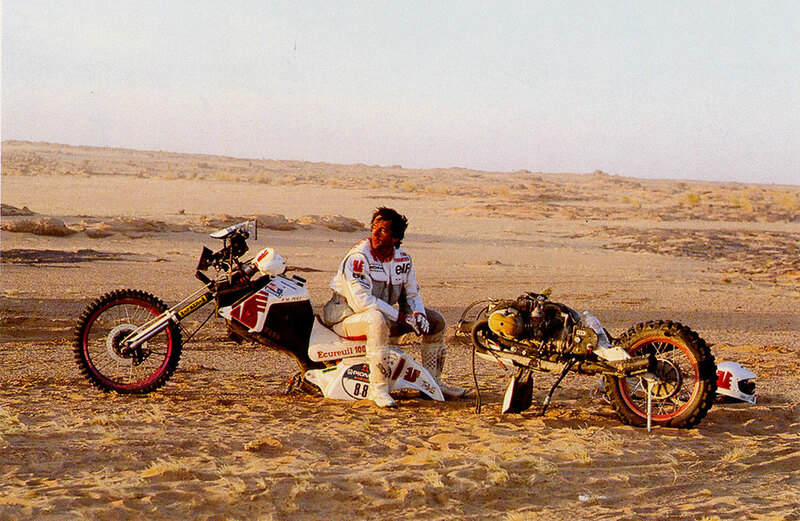 Actually, during the last leg, Marc Morales was ranked 7th overall, was walking near the Lake Rose (Lake Retba), just three kilometres from the finish! 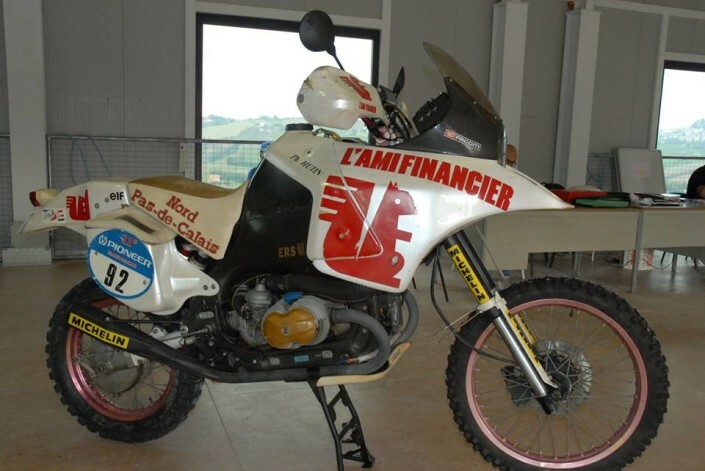 This bike is complete and original with the exception of the headlight protection, that could easily be reproduced. 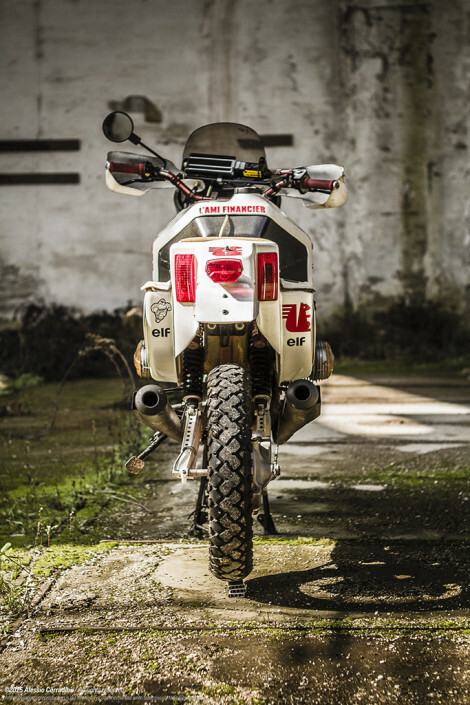 According to need is equipped with front wheels from 18, 19 or 21 inch. 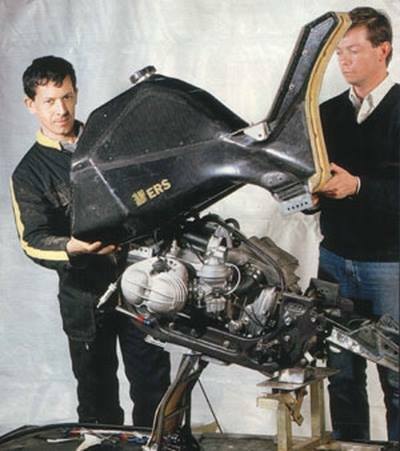 The engine, a 1050 model 1023 CC prepared by Herbert Scheck (the well-known German driver and BMW), and been ordered directly from BMW France. The bike is equipped with a Marzocchi fork and two rear Öhlins, the chassis and the suspension fitting of the engine are honeycomb and carbon were built by ERS. 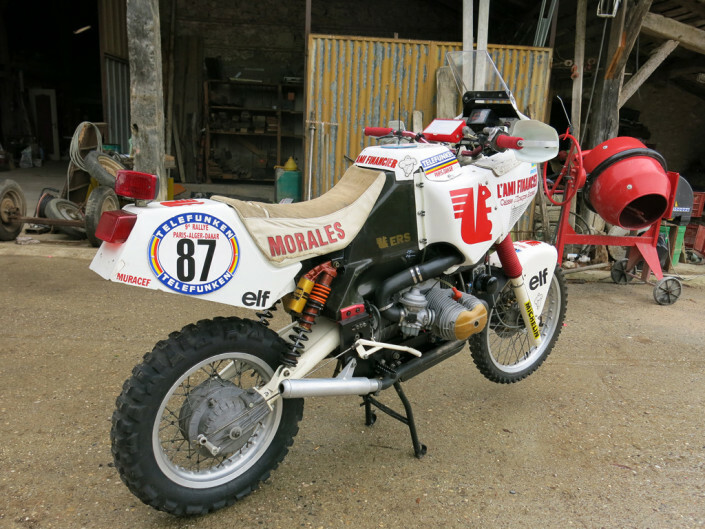 The bike is available in France, without valid entry documents for road use. 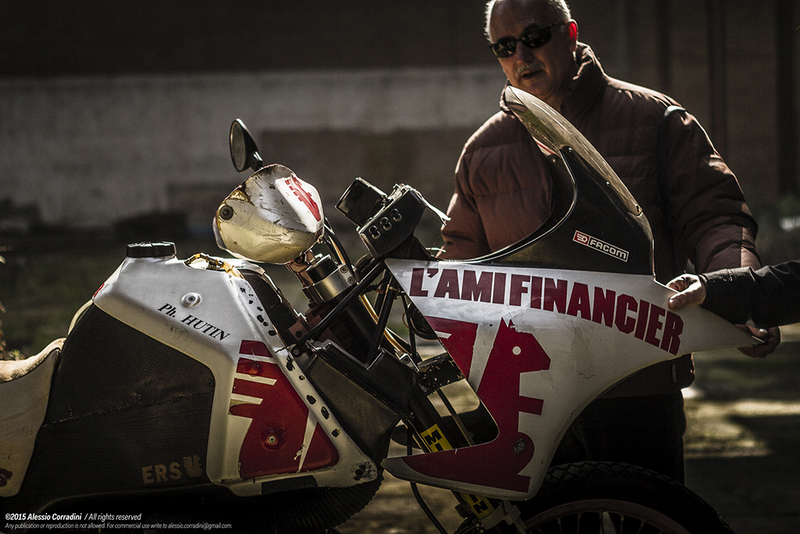 Actually these prototype raced with registration documents which corresponded to a production motorcycle. " Morales arrived in 3 km from Dakar in 3rd position.. 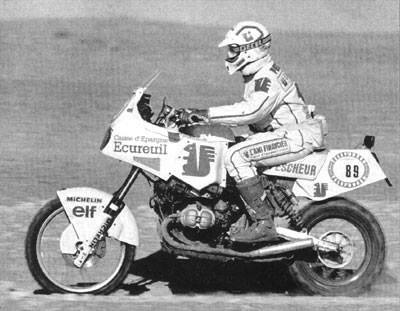 In 1987 It presents a motion from the project very interesting, the Ecureuil 1000 ERS conceived in 1986 by Joel Guilet (Ducati rider at the time Bol d'Or) on the initiative of the journalist and driver Pierre-Marie Poli. 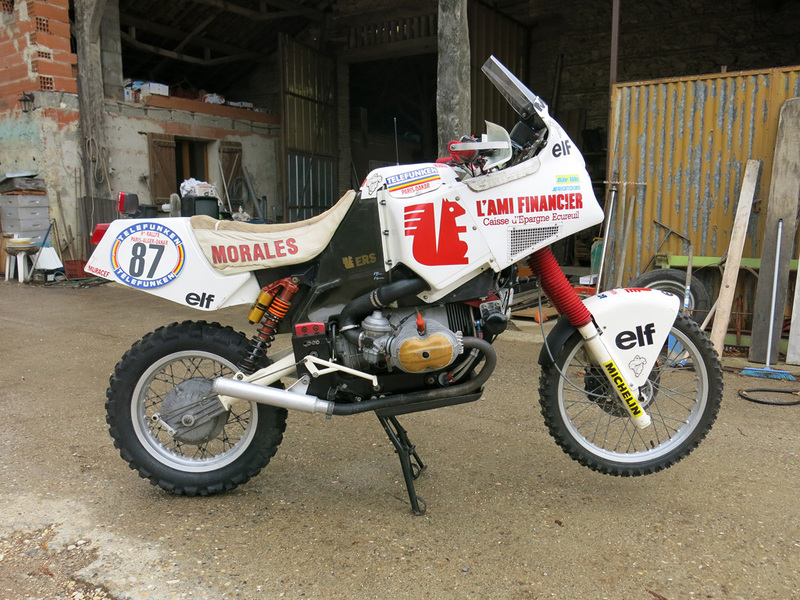 Equipped with air cooled boxer engine BMW 1020 CC, 80 HP / 6500 RPM / min (engine preparation made from Arcueil Motor). 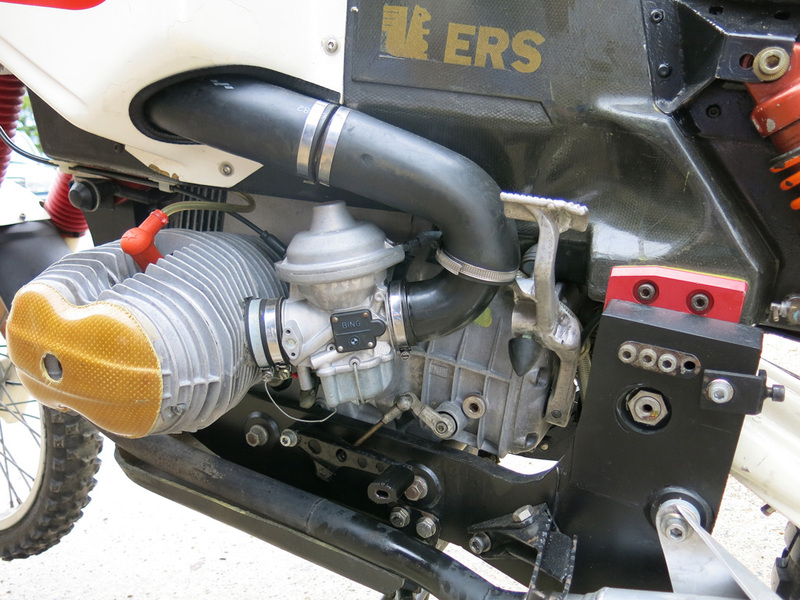 The originality of the ERS 1000 resided in its modular frame and carbon all disassembled very quickly, in just six minutes giving access to motor and transmission. This feature allows the ability to change the weight distribution and vary the distance. 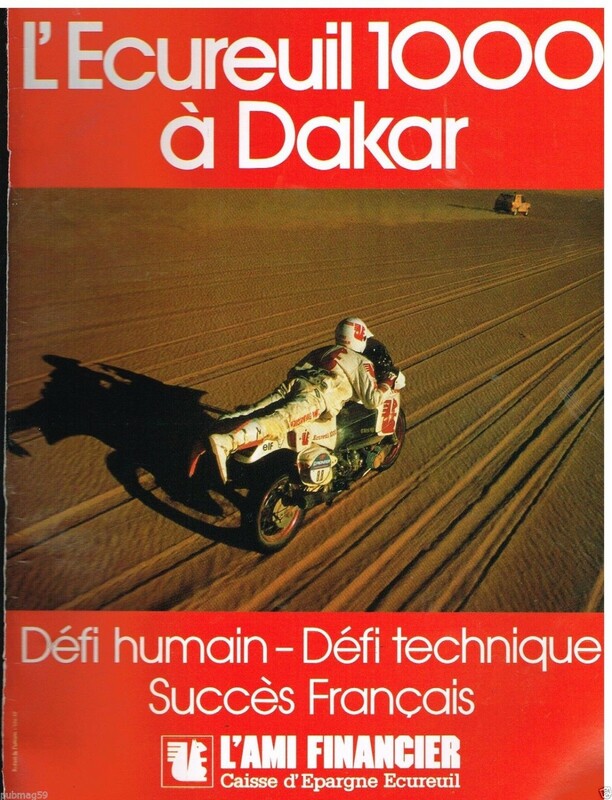 The project will be brought to the Paris Dakar also in 1988 and 1989. 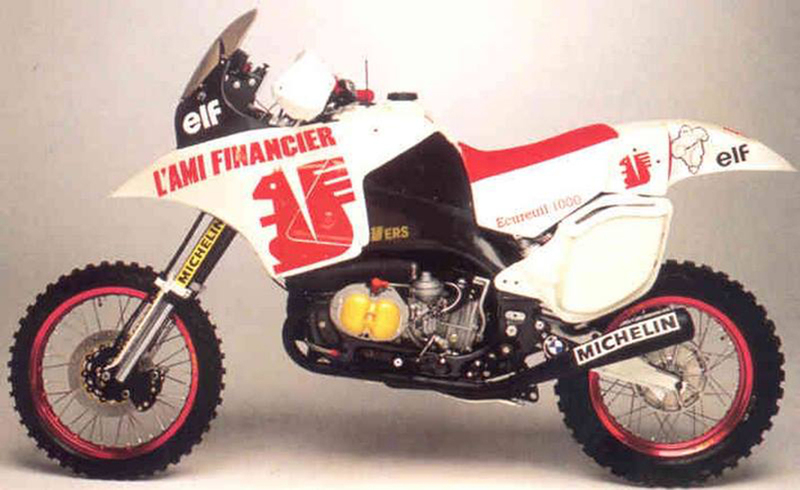 Official BMW twin-cylinder boxer engines using 1020 CC, the team Ecureuil recurs at Dakar 1989 with the same revolutionary bike used the previous year. 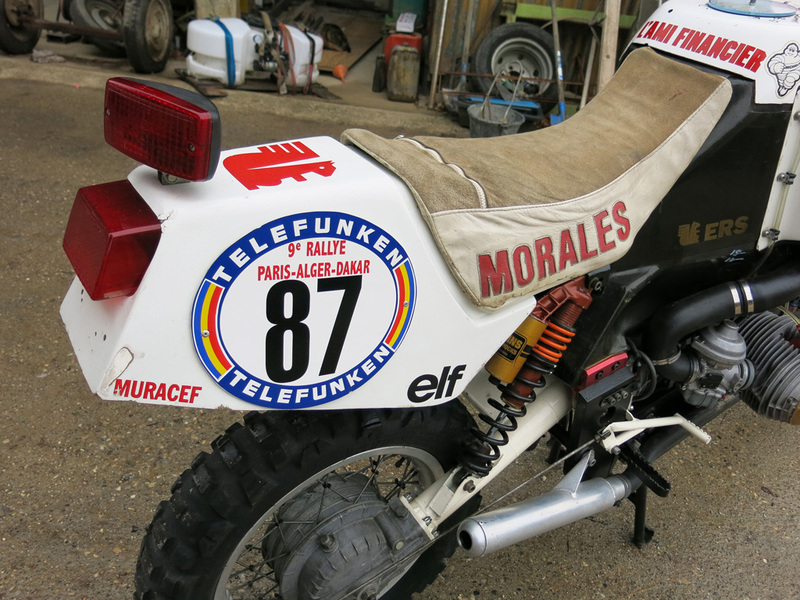 French is the prerogative of the bike futuristic monocoque made of composite material of carbon fiber and kevlar, that replaces the usual tube frame. 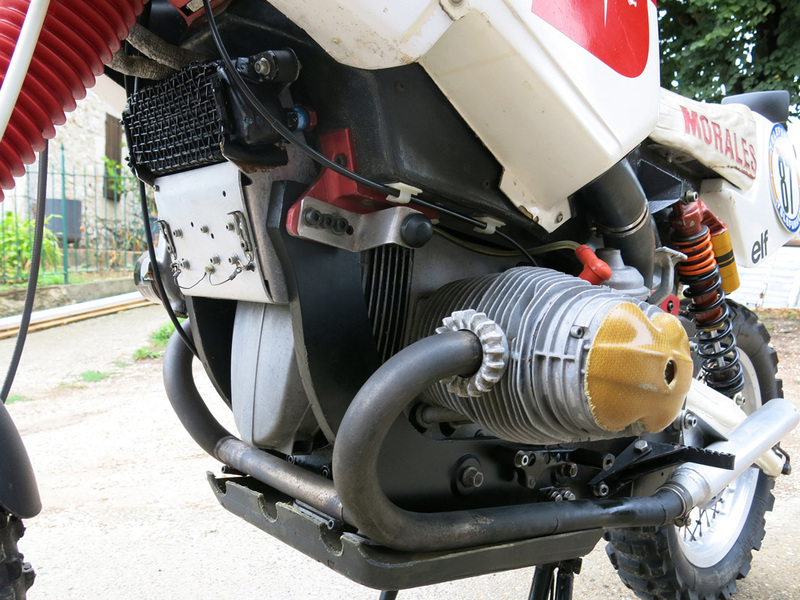 The entire shell weighs only 6 kg and is broken down into three pieces: the front fork supports, the upper floor doubles as smain tank and the lower contains motor, return and attack of the swingarm. 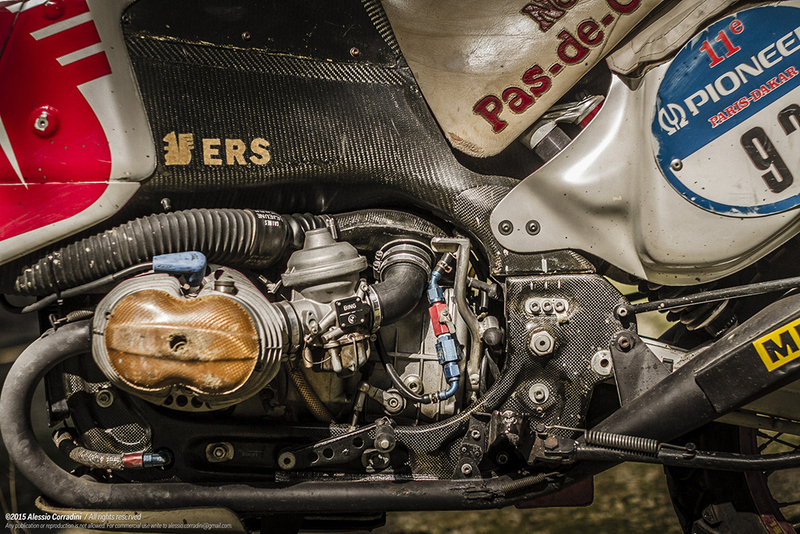 In case of breakage during the race, the same driver can remove the motor. 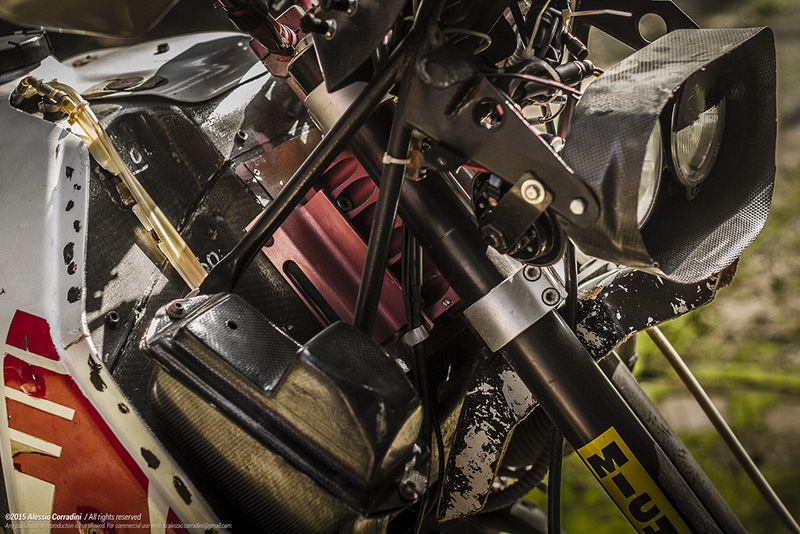 The steering column is adjustable in inclination in order to adapt it to the characteristics of the route. The main changes compared to the previous model relate to the shock absorber upper attachment properly reinforced, and fastening of the swingarm, now more robust and better designed. 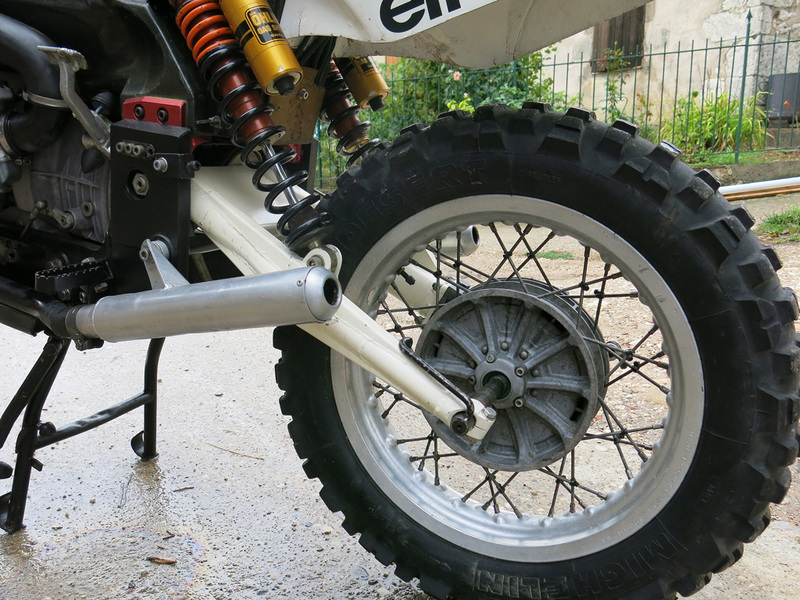 The fork is “overturned” with a range of 300 mm, the swingarm is made of light alloy and acts on two damping places much forward to bolstering understanding rear wheel travel is now giving 280 mm. 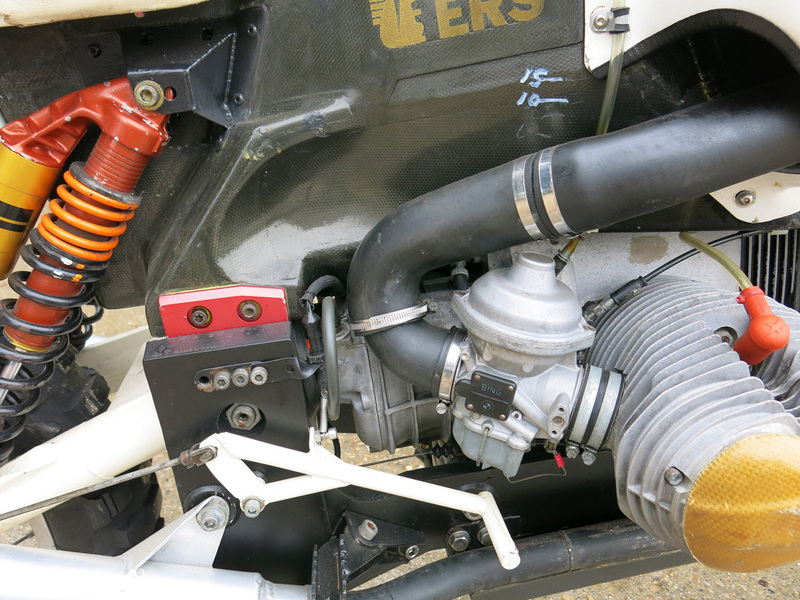 Dry weight declared is less than 170 kg; an outstanding result due to the massive use of lightweight material used at compo-site. The German engine is eighty horses of accredi- 6500 RPM; distribution pushrod and rocker arm with only two valves per cylinder, Automatic ignition advance electro-electronic, nagalla also for Bing Carburetors power vacuum from 40 mm. 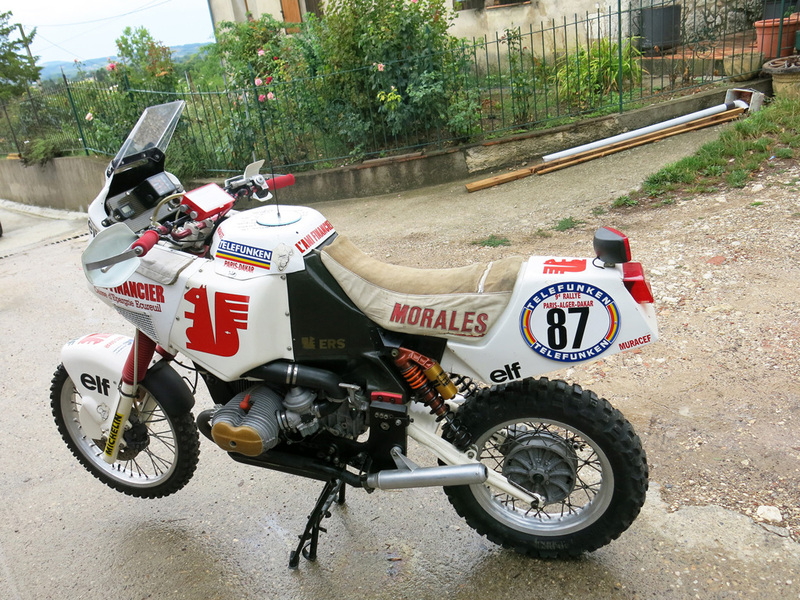 The clutch is dry, five-speed gearbox and final drive shaft.